Vietnam Railways (Đường sắt Việt Nam) is the state-owned operator of the railway system in Vietnam. The principal route is the 1,600 km (990 mi) single track North-South Railway line, running between Hanoi and Ho Chi Minh City. This was built at the metre gauge in the 1880s during the French colonial rule. There are also standard gauge lines running from Hanoi to the People’s Republic of China, eventually leading to Beijing, and some mixed gauge in and around Hanoi. 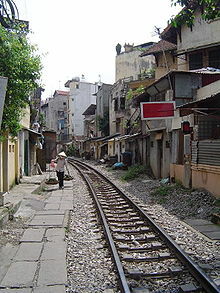 A section of metre-gauge line in Hanoi. Old locomotive exhibited in Vinh railway station. While the state of the country’s road network is continually improving, the railway system makes a significant contribution to the national transport infrastructure, with multiple daily freight trains, many being movement of containers. The 34-hour passenger trip between Hanoi and Ho Chi Minh City is very popular both with locals and foreign visitors, accommodations are hard seat, soft seat, hard sleeper and soft sleeper. Coastal resorts such as Huế, Hội An, and Nha Trang lie along the route and generate considerable tourist traffic. There are no travel restraints in place, and tickets for most trains can be purchased on-line. In the border region the Sapa line to north is a very popular tourist attraction, with first class accommodation available. East of Hanoi is dual gauge, and there are through trains to China, the proper Visas are required to book on cross border trains. The Ho Chi Minh City–Hanoi line has been rebuilt, damages by the war have received major repairs and upgrades. There is a long-term plan to build a completely new standard-gauge line to connect the two main cities. New international routes to Phnom Penh and thus via Bangkok to Singapore are also under consideration. A parliamentary resolution of 2005 proposed that foreign investors be invited to invest in Vietnam Railways. On September 11, 2008, the Cambodian Ministry of Transportation announced a new railway line with the total length of 257 km (160 mi) will connect Phnom Penh with Loc Ninh (Binh Phuoc province), Vietnam. This US$550 million project has been carefully investigated by Chinese experts and is about to be carried out in the near future. Vietnam is extending its network to Loc Ninh. In August 2010, the government announced plans to build two sections of standard-gauge railway, one from Hanoi to Vinh and the other from Ho Chi Minh City to Nha Trang. Although on the face of things the possibility of a good return might appear small, there are precedents: the lines into China have benefited from Chinese investment and, more recently, Japanese investment was spent on the Hai Van Tunnel project, a new road tunnel alongside the north-south rail line near Da Nang. At a more local level, the picturesque hill town and resort of Đà Lạt was once connected by a scenic little rack railway to the main north-south line at Thap Cham. Although there is now little visible trace of the trackbed in the green and fertile landscape, local businesses have secured a promise of government funding for its reinstatement, to benefit tourism in the area. Currently, the only railway at Đà Lạt is an 8 km (5 mi) remnant from the old railway connection that runs from Đà Lạt station to the nearby village of Trại Mát. This is run as a tourist attraction. Other projects likely to receive foreign money are proposed light rail systems within Hanoi. Vietnam Railways also planned a 1,630 km (1,013 mi) high-speed standard gauge link from its capital Hanoi in the north to Ho Chi Minh City in the south, capable of running at 250 to 300 km/h (155 to 186 mph). It was planned to have an initial travel time of 9 hours and to make a series of improvements over time to eventually reduce the time to 5 hours. The current single track line has journey times from just under thirty hours. The funding of the $33 billion line was to come mostly from the Vietnamese government, with the help of Japanese aid (on the understanding that Japanese firms would engineer the bulk of the project). In 2010, there was an unsuccessful push to fund the project, and efforts to promote the project have fallen off since then. The timetable called for the initial construction (the 9-hour line) to be completed in 2016, and the line improvements (the 5-hour line) by 2025. At one point, the Vietnamese prime minister had set a target to complete the line by 2013. Approval was delayed several times, and in May 2010, the plan was finally rejected by the government. China Railways DFH21, known as the D10H in Vietnam. ^ a b c "2010-10-01". Retrieved 2010-10-12. ^ "A Brief History of Dalat Railroad". Viet Nam Air Force Model Aircraft of Minnesota. 2007-10-07. Retrieved 2008-03-14. 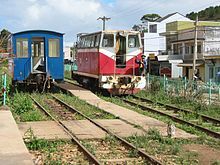 ^ "1928 Thap Cham-Da Lat Railway returns". Vietnamnet, from official Viet Nam News agency. 2007-10-07. Archived from the original on 2008-02-10. Retrieved 2008-03-14. ^ "Railway plans to build 880 km express line". Viet Nam News. 2006-07-20. Retrieved 2006-07-20. ^ "Vietnam Railways Website (English) - Check the timetable from Ha Noi to Sai Gon (or vice versa) to see the journey times". Vietnam Railways. Archived from the original on 2008-05-10. Retrieved 2008-05-10. ^ Bill Hayton (2006-07-20). "Vietnam plans new railway link". BBC News. Retrieved 2006-07-20. 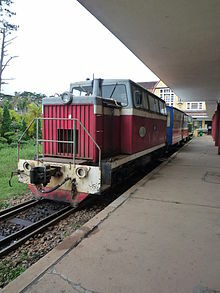 Wikimedia Commons has media related to Vietnam Railways.